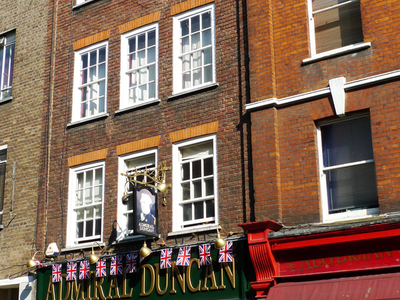 The Admiral Duncan is a pub in Old Compton Street, Soho in the heart of London's gay district. It is named after Admiral Adam Duncan, who defeated the Dutch fleet at the Battle of Camperdown in 1797. It is known for being the scene of a bomb attack, carried out by Neo-Nazi David Copeland on 30 April 1999. On the evening of 30 April 1999, the Admiral Duncan was the scene of a bomb blast that killed three people and wounded around 70. The bomb was the third that had been planted by Neo-Nazi David Copeland, who was attempting to stir up ethnic and homophobic tensions by carrying out a series of bombings. Copeland's previous London bomb attacks, on 17 April in Brixton and 24 April in Hanbury Street, had made Londoners wary. Although they had been described as race-hate attacks, police had issued a warning that a gay bar could be the bomber's next target, and The Yard – another pub in the area – had displayed a poster warning customers to be alert. On Thursday 29 April, CCTV footage from Brixton was given wide publicity after an image of the suspected bomber was identified on it. This caused Copeland to bring forward his bombing of the Admiral Duncan to Friday evening. The unattended bag containing the bomb was noticed by patrons of the Admiral Duncan; however the bomb exploded at 6:37 pm, just as the bag was being investigated by the pub manager, Mark Taylor. Three people were killed, Andrea Dykes, 27, four months pregnant; her friend, Nik Moore, 31; and John Light, 32, the best man at the wedding of Andrea and her husband, who was himself seriously injured. Around 70 people were injured. Here's the our members favorite photos of "Pubs and Bars near City of Westminster". Upload your photo of The Admiral Duncan! Category:Pubs and Bars in City of WestminsterHelpful Links:City of Westminster Overview References: 459140, 2599768 Claim:If you are the owner of this property claim it?